The Subsea Tieback Forum and Exhibition is a convention where the leaders in subsea tieback technology (connecting existing offshore wells to new “satellite” discoveries on the ocean surface) come together to make instrumental relationships within the industry. 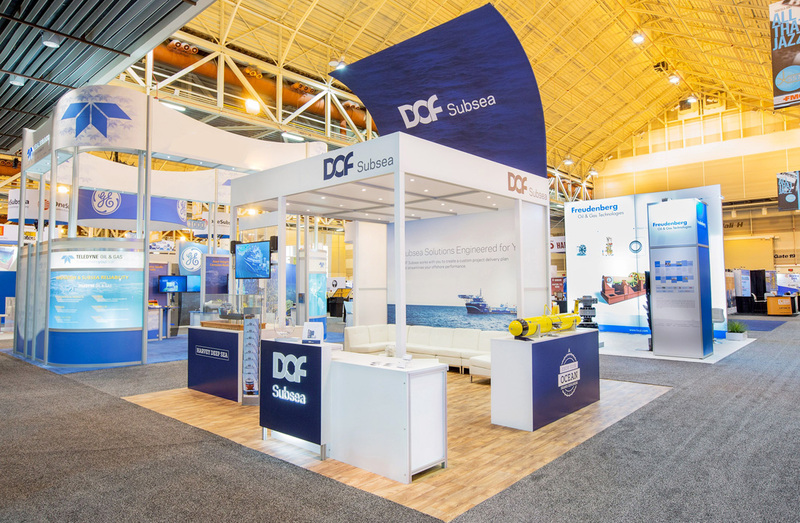 As a leader in the subsea exploration field with a fleet of state-of-the-art, purpose-built vessels, DOF Subsea looked to the exhibition as a rare opportunity to showcase its unique capabilities to the leaders and decision makers within this niche environment. 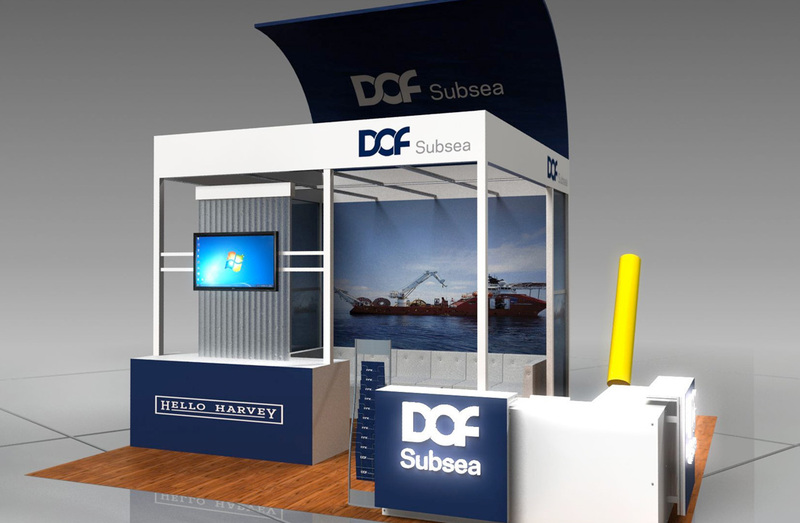 The main objectives for DOF Subsea at Subsea Tieback were to showcase their tieback technology assets while elevating their brand and presence among their peers in order to generate leads and build interest in utilizing their unique set of capabilities. There were two particular assets that DOF Subsea set out to highlight – The Harvey Deep Sea liner and the Glider Autonomous Underwater Vehicle (AUV). The fundamental concept for framing the technology was to create an artificial environment that felt very much like that of an offshore platform or dock. The design pulled together detailed components that drew the attendee into that space. The top of the booth took on a curved wave look, giving the booth an “at-sea” design element arching above it. The giant graphic behind the display featured vessels on the water and designers paid particular attention to include as much surface water imagery as possible. The backdrop for the Harvey Deep Sea liner was a signature feature of a water wall that not only gave a feeling of moving water in the display, but actually provided the sound of water to enhance the feel of being on an ocean liner. Even the floor was wooden to give the feel of being “on deck”. In order to give the proper attention to the technological detail, several steps were taken within the design to deliver that very specific messaging. Demonstration videos played prominently above the liner model just in front of the water wall. The Glider AUV was displayed in its own space, allowing the unique color and design of the product itself to draw attention while literature racks with the vessel detail were placed nearby so attendees could easily peruse data about the model. 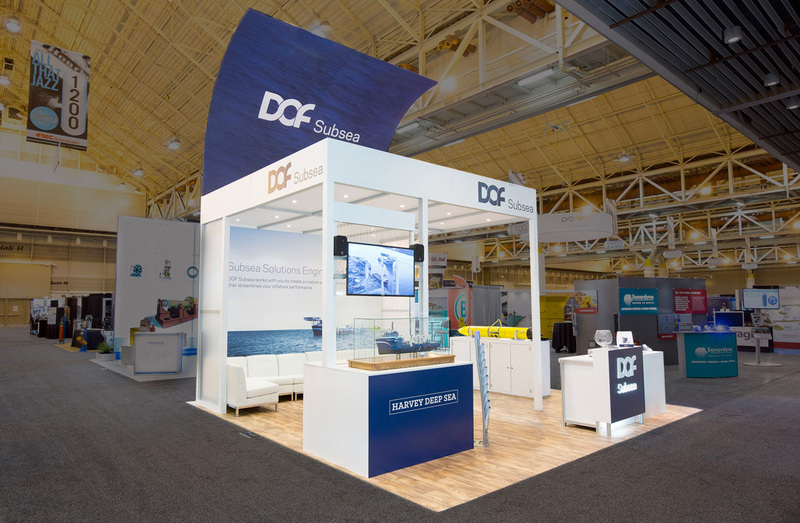 No detail was overlooked in the show strategy to engage the audience and achieve DOF Subsea’s objectives.